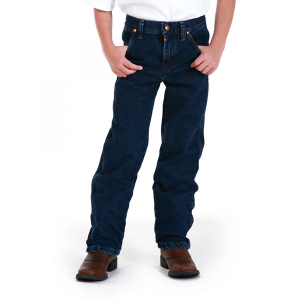 13MWJ Wrangler Boys' Cowboy Cut Original Fit 1-7 Wrangler Original ProRodeo Jeans. Featuring a new adjust-to-fit waistband. Authentic five pocket styling. 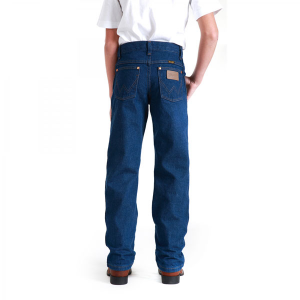 100% cotton, heavyweight broken twill denim. 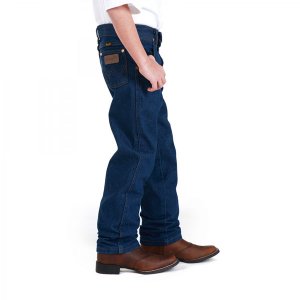 13MW Wrangler Boys' Cowboy Cut Original Fit Jean Wrangler Original ProRodeo Jeans. Featuring a new adjust-to-fit waistband. Authentic five pocket styling. 100% cotton, heavyweight broken twill denim. 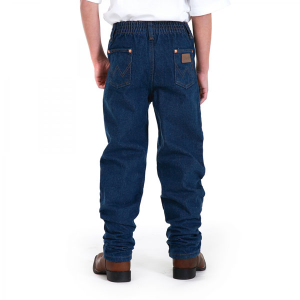 13MWSPI Wrangler Boys' Cowboy Cut Student Jeans Wrangler Original ProRodeo Jeans. Authentic five pocket styling, 100% cotton, heavyweight broken twill denim. 22JW Wrangler Boys' No. 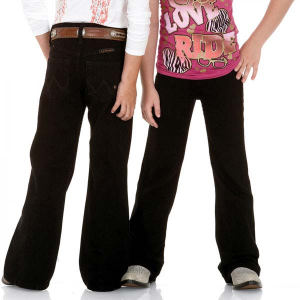 22 Original Fit Jean 4-7 This jean features five pocket styling, a relaxed seat, thigh and knee, it sits at the waist and has a slightly tapered leg. 20X embroidery on pocket facing, and 20X woven label on hip pocket. 22BW Wrangler Boys' No. 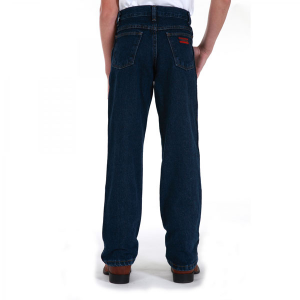 22 Original Fit Jean 8-16 The jean features five pocket styling, a relaxed seat, thigh and knee, it sits at the waist and has a slightly tapered leg. 20X embroidery on pocket facing, and 20X woven label on hip pocket. 33JWXVM Wrangler Boys' No. 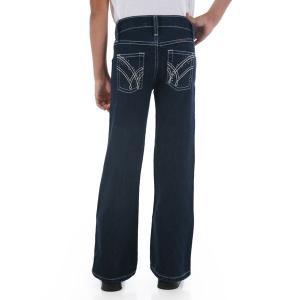 33 Extreme Relaxed Fit Jean 1-7 This jean features five pocket styling, an extra relaxed seat, thigh and knee. It sits lower on the waist, has a straight leg and patch watch pocket. 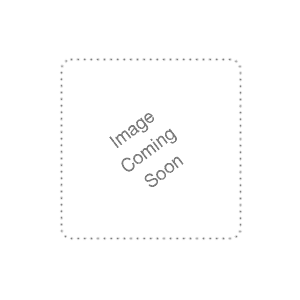 33BWXVM Wrangler Boys' No. 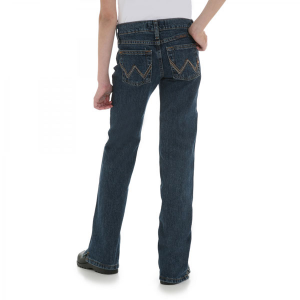 33 Extreme Relaxed Fit Jean 8-16 This jean features five pocket styling, an extra relaxed seat, thigh and knee. It sits lower on the waist and has a straight leg and patch watch pocket. 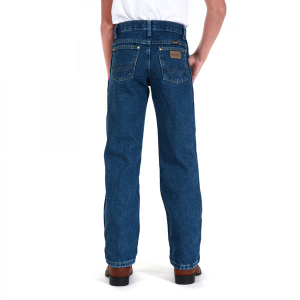 JRT30EB Wrangler Boys' Retro Jean 1-7 -Everday Blue A fresh nod to the past. 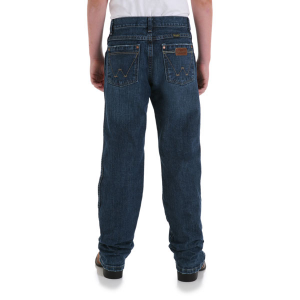 These jeans have authentic five-pocket styling. BRT30 Wrangler Boys' Retro Straight 8-16 A fresh nod to the past. 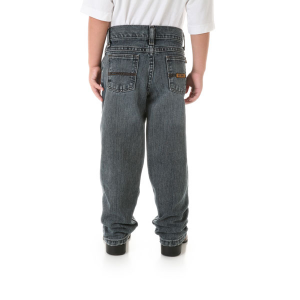 These jeans have authentic five-pocket styling. 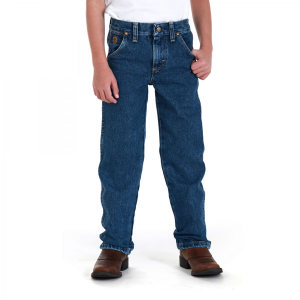 15MW Wrangler Children's Wrangler ProRodeo Adjustable Elastic Jean 1-7 This jean features four pocket styling with a tapered leg, scoop pockets and rivet trim. 100% cotton.